I purchased a Weed Eater Twist and Edge 112C corded electric string trimmer from my local Walmart store. There were not many choices available, but I have been very happy with my purchase. I have not had to do any maintenance on the weed eater, other than changing the spool as needed. It works really well, even on weeds that are thicker than most. It edges close to objects and is easy to operate. One piece of advice I would give is to think about where you will be using the weed eater before purchasing one. I knew my arms would get tired quickly so I did not buy a gas powered weed eater. I regret that now as I have to drag an extension cord wherever I use the weed eater and be extra careful that I do not slice the cord as I am cutting weeds. I was more concerned about the weight of the gas than dragging the cord. I wish I would have thought it through a little more as part of where I use the weed eater is a long way from the garage and I had to buy another heavy duty extension cord to reach everything. I also discovered my arms tire quickly anyway so I might as well have gotten the gas powered weed eater. Another issue I have had with this product is that it seems the plastic string breaks easily and I constantly have to stop and unplug the machine to pull the string out. Sometimes, it is hard to pull the string out of the spool. Of course, this could be me hitting things I should not be so close to and causing breakage and not any issue with the weed eater itself. I have not had any problem finding replacement spools for this weed eater. I would definitely purchase this brand of weed eater again, but I would get the gas powered model and also several replacement spools of string as I tend to go through them quickly. Again, this is not a problem with the weed eater itself, but a problem with the operator – me! 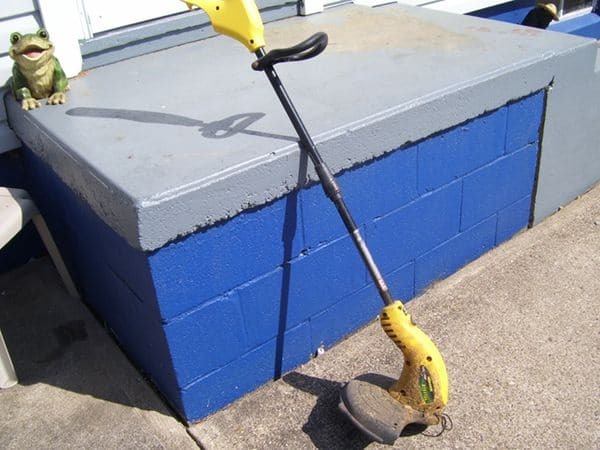 Do you own a Weedeater brand string trimmer? If so, leave a comment and let us know what you think about it.